Starring: Sunny Pawar, Dev Patel, David Wenham, Nicole Kidman, Rooney Mara, and more. At the age of five, little Saroo (Sunny Pawar) gets separated from his brother Guddu (Abhishek Bharate) and is taken thousands of miles away from his home by train. From here on, Saroo struggles to survive as he is hungry, alone, and in danger. Beyond this point, Saroo soon gets discovered by a young couple by the names of Sue and John Brierley (Nicole Kidman and David Wenham). As the two adopt Saroo, they raise him to adulthood (played by Dev Patel) and he goes on a personal mission to figure out where he is from and ultimately reunite with his family. Just to fire it out there quickly, ‘Lion’ is yet another rightful Oscar contender. Although I do not feel it is as strong as many others within the Best Picture category, I enjoyed ‘Lion’ a whole lot. The story was wonderful to witness, although around the middle of the film it seemed to draw itself out a bit with some story jumps and some pointless outside plugs. The story of young Saroo was by far the (second) best part of the film. The struggles he faced while he was separated from his brother and striving for survival was very compelling to watch. The end of this film was the absolute best part of it all. For me, everything that was worked for from the start to about the point where twenty minutes are left in the film just seemed satisfyingly concluded and fulfilling (and personally tear-jerking)… Now, again, there were some points where the story felt drawn out to the point for me to feel it during the film which places this a bit below other Oscar contenders. I also felt as though Rooney’s character was not important enough for me as well as Saroo’s adopted brother. With this being said, I am sure the novel actually gives them more importance but this film falls victim to not having sufficient run time to make them feel involved enough in the film. Overall, ‘Lion’ is a wonderful film. The story is an absolute trip to watch unfold and learn of Saroo’s life. Maybe not as strong as other Oscar contenders but as a stand alone film, it is leagues ahead of the typical Hollywood drama. 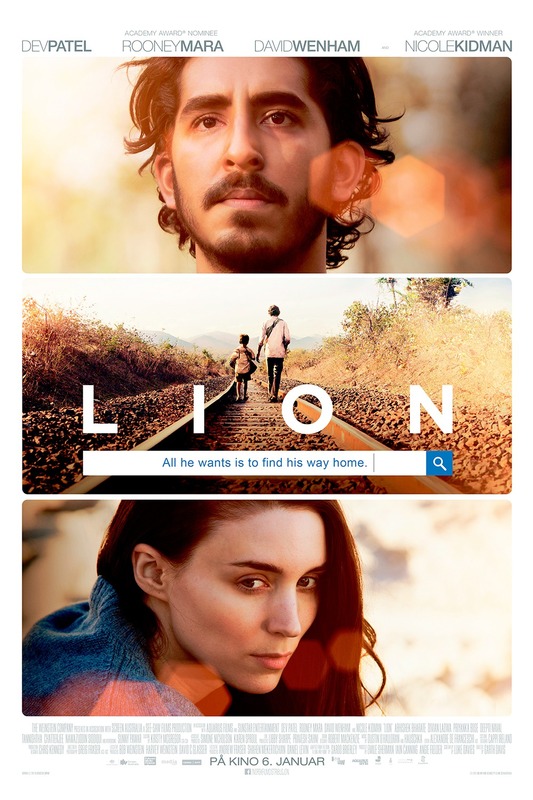 Posted in 2016 Movies, Movie Review.Tagged Dev Patel, Garth Davis, Lion, Nicole Kidman, Rooney Mara.